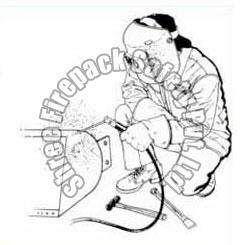 We make available Asbestos Fiber Apron that is manufactured using asbestos cloth, and/or contained asbestos inside the linings. We design our Asbestos Fiber Apron to endure the intense heat of frat house barbecue grills. We endow our Asbestos Fiber Apron with a wide range of properties in accordance with the area of its application. We also offer customized Asbestos Fiber Apron at economical prices. Size Available : 24" X 36", 24" X 48"